After relocating to San Jose I bought a 2005 H16 from one of the local fleet members. I discovered a couple weeks after bringing it home that the front crossbar was cracked. I worked out a deal out with the seller to get a new one ordered through the local Hobie dealer. After receiving the new one it took me about a month to get the old crossbar taken apart and begin installing the new crossbar, once I did I hit a pretty big roadblock. At first, I ran into an issue getting the dolphin striker to thread into the mast base without if cross threading. After a few failed attempts at threading into the base with it attached, I decided to drill out the rivets and remove the base from the crossbar. With the base removed the rod easily threaded in. When I went to slide the assembly into the crossbar I discovered that the base does not seat properly, obviously, something is miss aligned/drilled (see attached photo). My initial thought was that the issue had to be the striker rod I was reusing. I have inserted and spun the rod inside the holes in the crossbar while at the same time moving it up and down, no binding whatsoever. I have also rolled the rod on a flat surface, it is straight as an arrow. The conclusion I’ve come to is that either the crossbar or the mast base is improperly drilled. Figured I’d run it by this forum to make sure I'm not missing something before I reach out to the Hobie dealer. Not something I have heard. They only come with the casting installed for alignment reasons. I would re-rivet the casting and then use anti seize on the threads (clean the old threads). Location: New Port Richey Fl. "Rod straight as an arrow" it should have one bend I don't know the angle in the middle though. Good info from Matt. Thanks for responding to my post Matt. I have replaced the mast base before on other boats so I am familiar with the process. 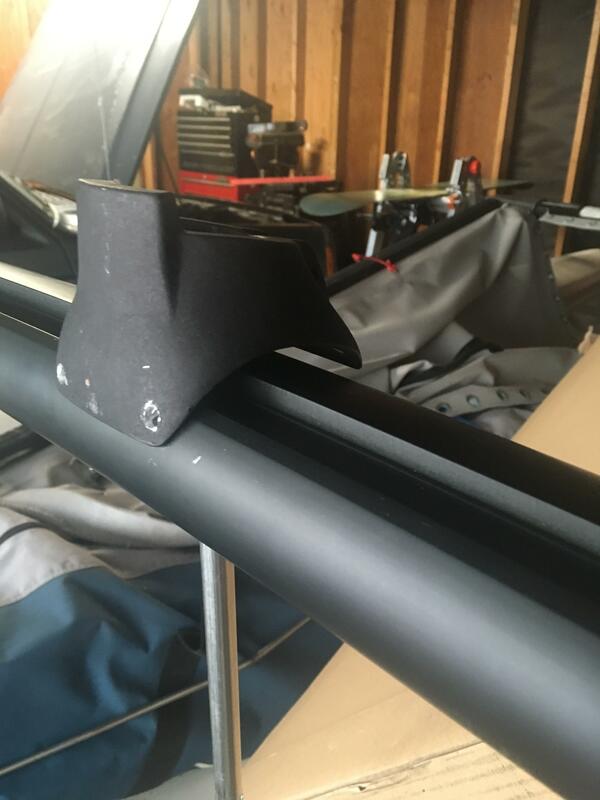 I am pretty much replicating the procedure you outlined on replacing the mast base, except when I thread the base on and slide it down it doesn't fully seat on the crossbar. As the photo indicates the front edge of the base is striking the extrusion before the rest can, leaving an almost 1/2" gap at the rear. I went ahead and made a phone call my dealer this afternoon. Going to make the hour and drive north and let them put their eyes on it. "Rod straight as an arrow" it should have one bend I don't know the angle in the middle though. I think what the OP is calling the “rod” is actually what Hobie refers to as the “post” (the vertical member mounted in the center of the crossbar below the mast step. The post should be straight. It sounds to me like either the hole through the center of the crossbar is misaligned or the threaded hole in the mast step is in the wrong position. I would assume the threaded hole in the mast step is formed as part of the casting operation, so that hole is probably correct. Anyway, have you tried unthreading the post from the mast step and then putting the step back on the crossbar with the rivet holes aligned (place rivets in the holes but don’t set them) and then looking up throught the center hole in the crossbar to see if it’s aligned clear through to the hole in the mast step? Took it by the dealer, they confirmed the issue is how the crossbar was drilled. Going to file a warranty claim on Monday. Confirmed by the metal shop lead man: The step casting was riveted to the crossbar by our metal shop... with the post threaded in. They use a mallet to hammer the post and casting down to seat tight and rivet... then remove the post. Threading it back in takes some pressure as there is a lot of resistance to over come. They tell me that this is the way it has always been on the 16. This is what the dealers is doing now. Got it back from the dealer. Beating into place appears to have worked, though there is still 1/16" gap between the base and crossbar. Hoping that getting the boat on the water and loading it up will get it fully seated.